Aurangabad: Citizens of Aurangabad will take out a morcha to the office of the commissioner of police on Saturday, January 19 to protest the rampant sale of drugs and liquor in the city. The Morcha will demand the police chief to act tough against the police stations under whose jurisdiction the business of drugs and liquor is flourishing. The Morcha will start from Jinsi Police Station at 11 am and will pass through Shahgunj, City Chowk, Jubilee Park and will culminate at the office of the police commissioner in mill corner. According to a press release issued by Aurangabad central MLA Imtiaz Jaleel, the recent murder of a youth Samad Khan by drug addicts in Kiradpura area on Saturday and the death of another 39 years old Shyam Fajge in Vijaynagar, Mukundwadi area due to alcohol addiction is a matter of concern for every citizen. Shyam was said to be a social worker who took to alcohol after a country liquor shop opened in the area and many youngsters from the area started consuming liquor. Angry residents targeted the shop by burning it after the death of Shyam last week. Besides he also complained about the open sale of gutkha trade in the city even though it has been banned by the government. It seems the people have no fear of the police or that they have been bought over which is why the sale/purchase of gutkha trade is flourishing in the city, he observed. Expressing grave concern over rising crime in the city due to drug addiction, Jaleel said that parents of all the children whose lives have been destroyed due to these bad habits will be participating in the Morcha. Citizens who care for the society will also be encouraged to participate in the Morcha. Jaleel said that people from all walks of life who want the city free from drug culture and who want liquor shops/permit rooms and bars to close down from their respective areas should come forward and participate in the morcha to press for their demands. 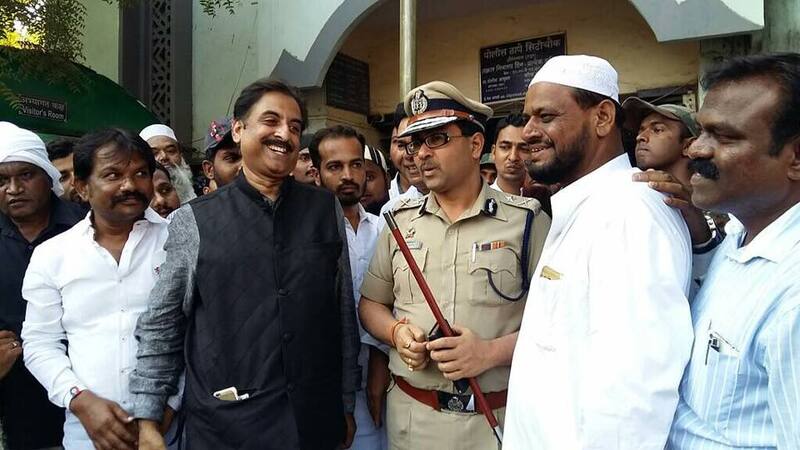 Jaleel is the first Muslim MLA from the country who has been successfully raising voice against the Waqf mafia in Maharashtra and is especially focusing on Rs 2000 crores Kondhwa Waqf Land spread over 45 acres in Pune and Rs 500 crores Dawal Malik Waqf Land spread over 200 acres of land in Karjat Tehsil of Ahmednagar District. He is also building a Rs 100 crores National Skills University for Muslims on 100 acres of land in Aurangabad in association with Maharashtra Waqf Liberation and Protection Task Force headed by Pune based social worker Saleem Mulla, one of the leading national legal voice on Waqf with the support of millions of Muslims and other marginalized communities from the India. Jaleel has demanded the construction of hospitals and a university for students of all communities on Dawal Malik Trust land where he claimed that the said land was a bonafide Waqf land according to the government of India gazetteer and Waqf records. His demand has been supported by lakhs of citizens in India. He has also demanded police protection to all Waqf activists in Maharashtra saying that the Waqf mafia was a professional crime syndicate. Parents of late Waqf activist have demanded a hospital and university be constructed on the Karjat Waqf land. Owaisi-Rao Will Deliver in Telangana!